2018 was a good year for Chicago real estate investors. The city created high paying jobs, rental demand was strong, and investors had a voracious appetite for assets. We broke down the data by multifamily property types and geographic regions within the city to help our clients better understand the data. Job growth in these highly skilled industries bodes well for the economy of Chicago. In 2018 Chicago average effective rent per unit increased by 3.2% year over year. The 2018 average effective rent per unit was $1,470 and the average effective rent per square foot was $1.95. Vacancy was down slightly at 6.9% in 2018 compared to 7% in 2017. 7,384 new units were delivered to the market with absorption of 7,040. The multifamily sales market was also very strong. 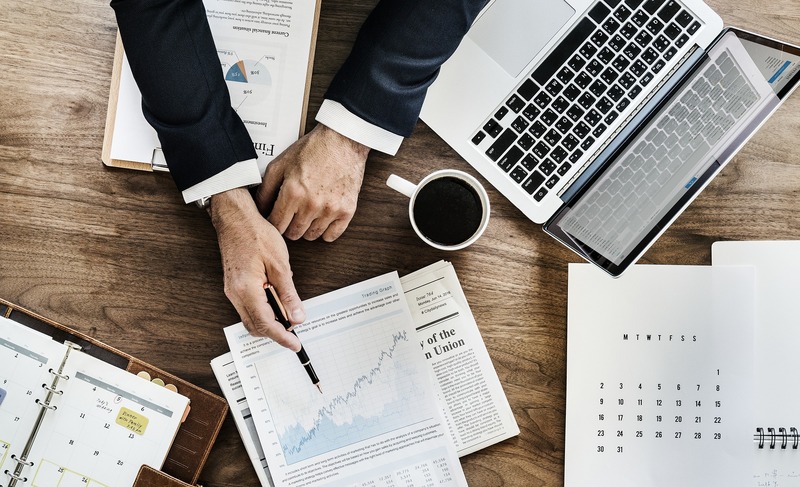 CoStar reports 1075 transaction in 2018 compared to 908 in 2017 and 2018 volume was up 24% to $3.4 Billion. Capitalization Rates were down by a few basis points in 2018 to 8.0% from 8.2% in 2017. Despite Chicago’s glittering skyline 96% of multifamily properties are not considered luxury. We use the CoStar “Star” system to segment what we call “Luxury” properties and “Walk-Up” properties. Because Root Realty specializes in selling and managing “Neighborhood” or “Walk-up” assets in Chicago most of which are outside of downtown, we are going to peel back the onion and take a look at how those markets performed. We will analyze the data for “Walk-Up” Chicago properties under 60 units north and south of 290. Figure 1: Chicago Vacancy, Effective Rents & Capitalization Rates. Source CoStar Realty Information, Inc. In 2018 Chicago average effective rent per unit increased by 1.5% year over year. The 2018 average effective rent per unit was $1,136 and the average effective rent per square foot was $1.56. Vacancy was down to 4.8% in 2018 compared to 5.2% in 2017. In 2017 “walk-up” properties north of 290 made up 20% of the total transactions in Chicago by dollar volume and 38% of the number of transactions. In 2018 they made up 14% of the dollar volume and 33% of the transactions. In 2018 Chicago average effective rent per unit increased by 1.8% year over year. The 2018 average effective rent per unit was $882 and the average effective rent per square foot was $1.15. Vacancy was down to 7.6% in 2018 compared to 8.3% in 2017. Capitalization Rates were down by a half of a percentage point to 9.9%. 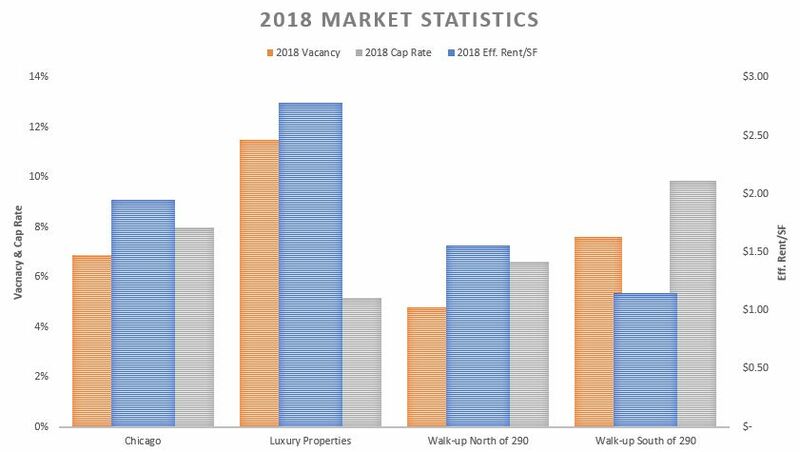 In both 2017 and 2018 “walk-up” properties South of 290 made up 43% of the number of total transactions in Chicago and less than 10% of the volume.